I'm sure someone warned me about two and a half, but somehow I am still surprised by the tantrums, and the constant "NO! ", and the attempts to outsmart us and push bedtime later (I'm ashamed to say that sometimes, she succeeds at this). This is an early design. 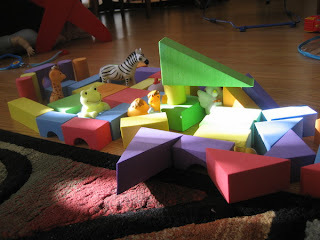 More recent designs include more spacious "caves" for all the animals. ...add uncooperativeness! That's the big one here. Finally, we're seeing the light at the end of tunnel now that THREE is only a month away. She actually spends more than 5 minutes playing by herself and that goes up exponentially if her brother is home.!! However we are still dealing with the stalling at bed/nap time. I have a feelng we will have to live with that one a bit longer. The low lows of 2 do seem to come with some pretty amazing highs. The cognitive jumps - I mean listening to him retell a series of events and come up with a conclusion - awesome. So yeah, lots of NOs - right in your face NOs which are really irritating. But often if he isn't tired or on the brink of a tantrum and is just testing boundaries a calm reminder that I don't like it when he yells at me gets a very quick response of a statement or question in a nice voice. The age is a constant reminder to not rest on my laurels because as soon as I think I have something figured out - bam he's goes and switches it up on me. Like changing from pjs to school clothes, for about a week or so it's been a breeze, just grab him up after MAx and Ruby is over, stand him on the changing table, show him his choice of two shirts, tell him his diaper needed to be changed so it didn't leak and there was no fuss, total cooperation. Ha. And that blissful phase has come to an end. Past two mornings he's fighting me, refusing the offered choices and this morning he took off his new diaper and peed on the floor on purpose. So thankful for wood and not carpet at that moment. Anyway, this is a really long comment to just say I agree. We should try and remember the very fun, cool, sweet, new things that come with 2/3 because the aggravating parts do seem to take all our time and focus. @mom2boys- yes, the story telling ROCKS doesn't it? Oh, the contrary-ness drives my hubby and me UP THE WALL! But that's a great zoo. I see a future architect in our midst! @paola - I am striving toward that light! @mom2boys - Oh man! The things that are going smoothly for a week at a time, then BLAM!! Huge fights and meltdowns over them! We parents are living on the edge, never knowing what will send the child over!